On the evening of the second day of Frankfurter Buchmesse’s 2018 Editors Trip to Germany for British and American Publishing Houses, the group of 15 heard from the leaders of two prominent independent German publishers on the state of the market and its impact on their operations. Moritz Kirschner of Verlag Antje Kunstmann and Jürgen Christian Kill of Liebeskind spoke together at Munich’s Literaturhaus, in a conversation introduced by Frankfurt’s Lars Birken-Bertscht and moderated by Publishing Perspectives. What became apparent was that while such small independent houses are feeling the same pressures that the major companies are feeling in Germany’s contracting book marketplace today, their response to those challenges may be different. Both Kirschner and Kill, while each passionately committed to his company’s mission, is emblematic of his respective house’s character—even in appearance and demeanor, Kill dapper and composed, Kirschner flamboyant and effusive. “Liebeskind was founded in 2000,” Kill told the group, “and publishes about eight to 10 titles per year, lots of translation” with a determined emphasis on literary work. And Kunstmann, Kirschner said, is an older, family-owned house founded in 1976 by Peter Weismann and Antje Kunstmann. It was renamed in 1990 after Weismann had left the firm, and publishes between 30 and 40 books per year, both fiction and nonfiction. “We had a No. 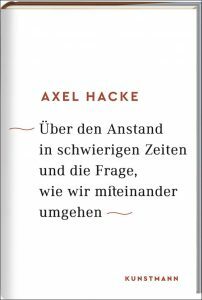 1 bestseller in Germany last year,” Kirschner said, “an essay on decency”—Alex Hacke’s On Decency in Trying Times and the Question of How We Can All Get Along (August 2017). While his list may at times seem “quite contrary,” his operation thrives on the sort of freedom it has to bob and weave with the times, responding faster than some of the big players in the market can. Decency in Trying Times clearly is close to Kirschner’s view of the shifting landscape for books in Germany. The Börsenverein des Deutschen Buchhandels (Germany’s Publishers and Booksellers Association) reported in June that some 6.4 million fewer people bought books between 2013 and 2017. Both men said that while they cherish the capability they have to truly direct their houses’ identities, market forces are still at play. As the arrival of the ebook has eroded support for paperbacks, Kill said, his business model has shifted: “We have a huge problem selling our paperback licenses. We were always dependent on Random House buying our paperback rights from us, that was very important for us. Now, that doesn’t happen. “The second problem is that newspaper reviews have been cut in half. Our books don’t get the attention they used to,” leaving publishers—particularly literary publishers with fewer commercial titles, like Liebeskind—”with a very big problem. Further, he said—to the nodding agreement of the British and American editors following the discussion—the readership has moved away from literary work. Lists are gradually being overtaken by more commercial titles (as Livre Hebdo‘s Fabrice Piault has recently said is happening in France, too). Kirschner was ready to question the weeklong refrain about “the lost readers of Germany” heard so many times during the editors trip. “It’s not that these are lost readers,” he said. “It’s not that they’ve stopped reading. It might be that they’re reading something else” such as self-published books and other content not necessarily tracked by the Börsenverein’s GfK study. “So I think the study might be a little bit off,” he said. “If they’re not reading, then something is wrong” with what’s being offered to them to read. “And I think we have to be a little bit careful about how we say this about ‘not reading,'” Kirschner said, because reading can be a hard sell from the outset. “And when we say, ‘We’ve lost so many readers and we have to make reading cool again,’ I agree. I agree, you know you have to have a certain kind of sexiness. But all this about, ‘Everybody is turning away from the medium'” of the book. For his part, Kirschner drew the biggest laugh of the day, proving that however much things have changed, he’ll still draw a line when he has to. Questioned by one of the visiting editors, Peter Joseph of HarperCollins’ Hanover Square Press, about whether he might consider a popular form like the Instagram poetry of Rupi Kaur, Kirschner was at great pains to say that he understands the appeal for some readers and the importance such work might have in a publisher’s budget. More from Publishing Perspectives on the UK and US Frankfurter Buchmesse Editors’ Trip to Frankfurt, Munich, and Berlin is here.